Synopsis: This books provides tools to improve readers’ confidence when it comes to public speaking. ‘Perform as a Leader’ explores the one recurring trait of every great leader: the ability to communicate effectively. It gives readers the tools to acquire this elusive skill and improve their personal and professional lives. Building on her experience as an RTÉ broadcaster, Orlaith has become a widely-praised expert in the field of communications. Throughout her career, she has improved the way thousands of people perform in business. 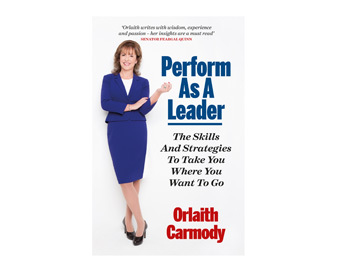 In Perform as a Leader, Orlaith has condensed her years of experience and knowledge into one all-encompassing handbook. ‘Perform as a Leader’ will appeal to anyone who wants to grow as a manager, public speaker, teacher, or role model. It will offer a real insight to the qualities that set some people apart and a step by step blueprint to acquire those qualities. Readers will learn the key skills in presenting and public speaking; conducting effective meetings; pitching for business; appearing in the media; coaching teams and negotiating to win. They will be given the tools to understand and overcome their anxiety and sweep away any reluctance that may have held them back in the past.